and finding DIY communities on the road. Here Comes the Wave, the latest release from veteran experimental artist Shana Falana, showcases the singer’s psychedelic and pop-infused stories. The album, which was recently released on Team Love Records, weaves together loops and cycles of sounds with meaningful lyrics that paint a picture of maturity and nostalgia. With years of experience in the DIY scene on both US coasts, Falana and collaborator/partner/drummer Mike Amari have carved out a unique niche for themselves in the music world. While on a cross-country tour promoting her latest release, Falana answered a few questions for The Le Sigh about her writing process and finding DIY communities on the road. The Le Sigh: I just saw you recently in Nashville at Fond Object! It was fantastic. I was completely mesmerized by your set up and loved watching you use all the pedals. Can you tell me about your writing and recording process? 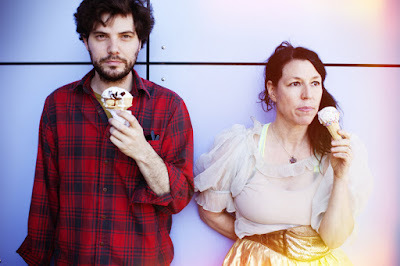 Shana Falana: Oh COOL! Thank you! I think that pedals have actually really helped me in my writing process. When you make your instrument sound different, it can totally inspire some weird song or melody to come out of you. Reverbs and delays are my favorite, but I also love some gritty distortion; it makes me play differently. My writing mostly took place in Brooklyn in the mid 2000's; “Cool Kids” I wrote recently but everything else is from Brooklyn. The recording process has been easy breezy because we work with Dan Goodwin at Isokon Studios in Woodstock, NY. He and I just cruise through the whole process, Mike (drummer, partner) and I go in so rehearsed and demo'ed up we just fly through the tracks with the greatest of ease. I record all the vocals at home (in my closet usually) to save on money and time and then we start mixing after that. Dan really understands our sounds; he gets tones up really fast and I don't even listen back anymore until after we've tracked a bunch of stuff. It's because of him that we can record so much. TLS: Your bio notes that collaborator and drummer Mike Amari and producer D. James Goodwin both play a larger role on this album. Can you talk about how working with them was different on this album than the last? SF: I really trust both of them a lot, but even still, it's taken me a while to really let go of some aspects of writing/producing. I've learned that things move faster when you just say "yes" and then the people you're working with feel more "a part of" it, which is more important than any idea you may have. The end of “Lie 2 Me” is all Dan and Mike. They had this idea that I couldn't wrap my head around: distortion, craziness emerging into some end point. I made dinner and they made the end of that song. TLS: I’m particularly fond of the song “Cool Kids.” What inspired you to write that one? SF: My intentions are really to acknowledge what I already see happening: kids coming out of their shells and people letting themselves dream big and follow a more creative career path. There's more room now for everyone to be weird, be a nerd, struggle with social awkwardness, but still get out to shows. I'm so inspired by the courage people have to expose their true selves and not want to fit in, not want to look the same as their friends, feel like they will be safe dressing in drag at a straight bar. I was the kid at school with bright 80's clothes and side ponytails and I really got made fun of. I have always been uncool, afraid of the pretty, skinny, tan, straight-looking cool kids. I really had to go out and find “my people” and it took a while! But if you know what I'm talking about, and you've finally found “your people” then you know how special it is, that instant love and connection, you feel like you're part of a team and together we can go do anything, and we did! We ran DIY scenes in San Francisco in the early to late 90's. We brought a lot of people together, my group was filled with every type of person: Burning Man types, jocks, punks, skateboarders, nerdy girls, people that were straight-edge, people that weren't...We created a huge family called the Castle Kids. We would throw parties and shows and support each other's events no matter what. We roamed around as a large group and it was in that world that I learned what a supportive community was. "Follow your bliss" was my path which eventually let me to get sober, too, almost 7 years ago this December. There's no right or wrong, good or bad: there's just experience and if you can, experience life as blissfully as you can. TLS: You’ve been out on tour for a while now, and still have a good number of dates left. What do you enjoy most about touring? Are there any cities or venues you particularly love? SF: We have been blown away in some places where there's this whole scene that brings us into their circle, in places like Minneapolis, Chicago, DC, Austin and more, but the real thing about touring is the intention of doing it. We are saying to people “this is how far we are willing to go to bring our music to you” and hopefully that comes across and people are moved to check it out! TLS: In relation to touring, how do you stay entertained on the road? SF: Podcasts! Museums! Walks in a town we've never been! Food, food and more food! (It's a food tour). Reading on the Internet about these towns we're driving through while one of us is driving, like what is the history of El Paso​? ?​ We're also usually surrounded by friends who've done this so much and we got some visiting to do. TLS: I love the album cover – a polaroid of your face altered by Carla Rozman. How did that collaboration come about? SF: Mike's idea! He is a genius designer in his own right. He knows how to brand and he understands me and my creative vision, so he completely produced the artwork and design. Carla did a ton of covers (bless her) and we all picked this one together. I work with amazing people. TLS: The song “Castle Kids” about the end of the DIY scene in San Francisco. What do you miss about it? Now that you’re in Hudson Valley (about two hours north of Brooklyn), what do you think about the scene there? I'm in San Francisco right now writing this! I honestly find my DIY scene on the road quite often in others' DIY scenes. It's amazing to me how it's the same, it's the same kind of community we had but everywhere, so I don't miss it as long as we keep touring! Our scene in the Hudson Valley is growing with Brooklyn transplants and people from San Fran and it's so blissful. I still love the Brooklyn scene. It's gotten so super friendly and warm, I think because people are moving there from the Midwest and taking over booking all the venues. I had left San Fran in 2003 in search of a vibrant music scene in Brooklyn and I'm so glad I did; it's opened up my whole music world. TLS: When tour comes to a close and the holidays are over, what are you going to do next? SF: I always get projects ready for winter, it's a slow time for me work-wise as well so here's what I got coming up! ​ I have more 4-track recordings that I want to digitize to put out like we did with our cassette tape release Shana Falana Sings Herself to Sleep. It's like an audio diary of me in SF in the 90's, sort of Daniel Johnston meets Beck's One Foot in The Grave​. I want to make new projections for our live set and ​start syncing them up with the songs since we can do that now. We are going to start working with Ableton​​ (software for music production), it's going to help us tighten up the live set. I want to work on the "Heart~​Felt​~​Tour" where I will be bringing my sewing machine on the road and for a donation I will sew a felt heart on your sleeve (you can bring a long sleeve sweater or shirt) and you will take an oath that you will be more vulnerable in the world, ​thus hopefully becoming more empathetic to those around you​. I will use the donation money collected ​to buy literature for this 12-step meeting I've been​ bringing to a women's rehab every Thursday ​night for more than 3 years. These women need a lot of support​ and hope, and they have so much time to read! TLS: What do you want people to take away from your music? SF: Preoccupations, Whitney, Cate Le Bon, Air Waves, ​new Brian Jonestown Massacre, Kero Kero Bonito, Porches, Free Kitten, the Sonic Youth EP 1982. Listen to Shana Falana on bandcamp.